Seth wanted Japanese last night so I made sashimi. 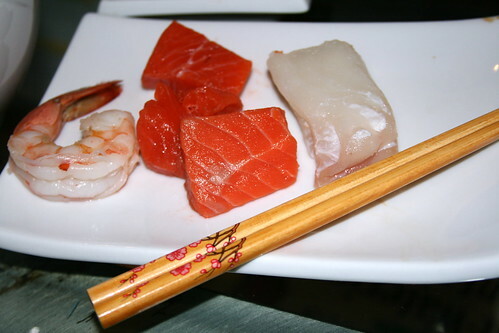 Sashimi is just like sushi only there's no rice. So basically you're eating raw fish dipped in soy sauce with wasabi. I found wild-caught shrimp, wild King salmon, and wild halibut at Whole Foods. Seth could probably eat this every single day. I try to make it for him once a week or at least once every two weeks. I do love the rice and I wish we could have regular sushi, but we are going to try to stay off grains for a while. This meal is pretty much GAPS-friendly. The only thing I'm not sure about is the soy sauce. Soy is not technically legal on the GAPS diet. I have tried to serve plain raw fish without any soy sauce — but Seth wouldn't eat it. So we cheat. Oh, and the miso soup has soy as well. Sigh. But we just can't go without Japanese food. Miso soup is so good for you. It's a real bone broth made from whole dried fish. Bonito Flakes are made from bonito, which is similar to mackerel. Since it's the whole fish, you get all the organs and the heads, which means you're eating the thyroids. This is one of the biggest sources of iodine in the Japanese diet, and this is why they traditionally eat miso soup with every meal — even breakfast! The other great thing about miso is it's a bone broth that you can do in a jiffy. Unlike other bone broths that require a minimum of 8 hours of simmering, you only need to simmer bonito broth for a few hours. I dressed it with a little rice wine vinegar. I'm not actually sure if this is GAPS legal. I bought this seaweed salad at Whole Foods. It did not have anything bad in it. I used to buy seaweed salad at Mitusuwa Japanese grocery store — but then I read the label and found out that they put sorbitol and MSG in it. Luckily, Seth loved this salad just as much as the one from Mitsuwa. I don't mind paying a lot for good quality wild-caught fish. But $14/lb for seaweed? I'll post a recipe soon for miso soup — it's so easy to make. I gave Kate a slightly different dinner. South River Miso has some wonderful soy and/or gluten-free misos. 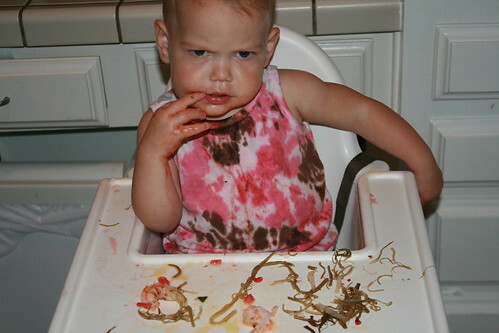 Before I developed an allergy, I especially liked the chickpea, which is both soy and gluten-free. And the Red Pepper and Garlic. They sometimes have tamari available as well. They won’t be shipping til the 15th (their misos are raw, so hot weather can make them bubble over and leak). Oh it looks like they will have it in the fall. 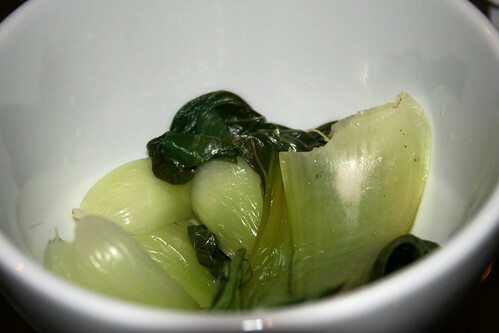 They also have a dandelion leek miso. Both of those would be GAPS legal. YAY! I’m going to order some. You’re very welcome. They make the BEST miso (and tamari) I’d ever tasted. I used the tamari in place of soy sauce with great success. IIRC, the garlic and red pepper is based on the plain chickpea miso. I never subscribed to the whole low fat diet thing. I am grateful that I didn’t because I’m healthier than I would be if I had. And I think it was easier for me to conceive. Hi, Carys, I don’t think chickpeas are GAPS legal. Darn. I think we will continue to cheat on this one — once or twice a month. I just can’t go without Japanese food. Dr. Cowan said not to try to be perfect on the GAPS diet. He said to just do the best you can. I think it’s different when you have a severe problem like an autistic child or a very allergic child — one little cheat can be a nightmare. But we are lucky in that we can cheat a little. Ann Marie, do you have a link handy that explains the GAPS diet? It sounds interesting. Yeah, I agree with SF. I have either gluten intolerance or celiac disease (gluten free 3 years, and no way on EARTH I’ll go back on it just to get tested! ), and had an issue of cross contamination 3 weeks ago — I held hands with my husband after he ate a sandwich, then later ate safe picnic foods with my barehands at the beach. My fibro and arthritis both flared up like CRAZY just from that. I’m still getting over it. Frustrating. What diet are you on? I mean, what foods do you restrict, other than gluten? Also there are 6 videos on YouTube you can watch with Dr. Campbell McBride who is the author of “Gut and Psychology Syndrome” (GAPS) and Donna Gates, author of “Body Ecology Diet” (BED). They are talking about autism specifically but it relates to anyone who had abnormal gut flora. I think GAPS and BED are truly revolutionary. Let me know what you think! I’m on a modified low-carb diet. I’m allergic to gluten, corn, nightshades, soy and most other beans (but not chickpeas), brassicas, shellfish, poultry, dairy, tapioca, xanthan gum, and more I’m spacing since it’s bedtime. Oh, no canned fish, and fresh only rarely. Pork only rarely. I’m have hyperinsulinemia, so keeping my blood sugar stable is vital (my pancreas releases too much insulin in response to any sudden rise in blood sugar). I’ve been very successful with the b/s control; my A1C is 5.2. I avoid much fruit and the starchier veg most of the time. Some blueberries, blackberries, beets, carrots. My regular foods are local, organic, grass fed beef, local organic eggs, celery/cerliac, spinach, cilantro, lettuce, coconut oil, hazelnuts, olive oil, lemons, cocoa, butter. I’ve been trying to find a source for raw grassfed butter, but so far I’ve only found organic :(. I take salmon oil and cod liver oil. I’ve been adding liver (we get it from the same rancher as the other beef). I do make bone broth periodically. 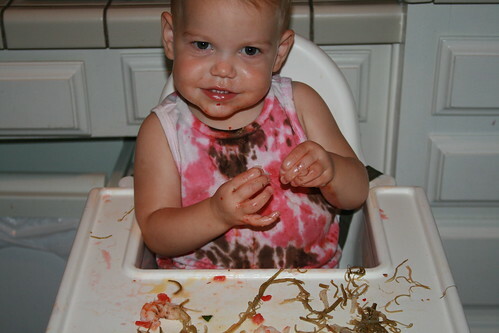 I don’t do well with raw fermented foods; I get very itchy. :( I adore homemade pickles, saurkraut, and kimchi, and I’m not sure why I developed a problem with them. I do suspect problems with gut flora. Yep it sounds like you have abnormal gut flora. 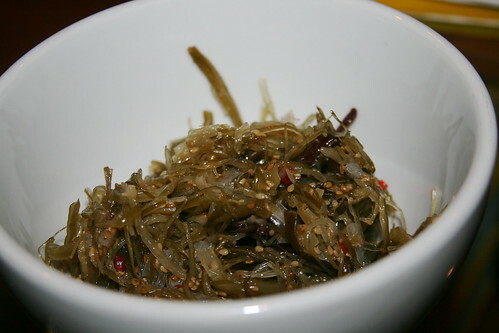 The fermented foods you can introduce gradually. The itchiness is a “die-off” reaction. So you have to go very slowly. Dr. C-McB says you can start with 1 or even 1/2 tsp of kefir — and then slowly increase by 1 (or 1/2) tsp each day. Juicing also helps with the die-off — it helps your body detoxify. Epsom salt baths also really help your body detox. You can also take very hot baths with fresh lemon juice. Are you taking a probiotic? I do take probiotics, and I love epsom salt baths. For me the itching seems to be more of a fungal issue. I’ve had a mold allergy since childhood, been allergic to antibiotics for 25+ years, wheeze in used book stores, etc. The itching isn’t as bad as it was, and I don’t have the patches of eczema I had for a while, but it’s been slow going. I took a lot of antifungal herbs for a while and that’s improved things dramatically. No more eczema, but I do still have to be cautious about what I eat. All those issues — mold allergy, fungal infection, eczema, food sensitivities — are due to abnormal gut flora. Which probiotic are you taking? Many (most?) of them are not very effective. If you have any suggestions for one without any of those, I’d be glad to hear of it. I seem to be mostly eating GAPS legal, except I do eat sea veg (I have low thyroid function and cant take RX meds for it; my neck starts swelling if I miss more than a day of sea veg. ), and I do use unsweetened cocoa as a vehicle for my potassium adn sodium in the morning. I’ve already cut out chickpeas and brown rice. Well there are two ways to go I think. One is Biokult. It does have a tiny amount of maltodextrin but Dr. Campbell-McBride says most people do not react. And she’s dealing with a lot of very sick kids. The other is kefir. I’m about to post Millie’s kefir protocol she is doing with her son. She has had great results giving him kefir and actually feeding him the kefir grains (they are not really grains of course). The thing with probiotics is you have to introduce them very very slowly. I hate to say this but the fact that you are not reacting could be that it is simply not working. Which is a waste of money. What Dr. Campbell McBride recommends with Biokult (or with kefir) is to take a very very small amount and slowly slowly work up. You can start with a TINY amount of kefir or the Biokult each day. Then every few days, add a tiny bit more. 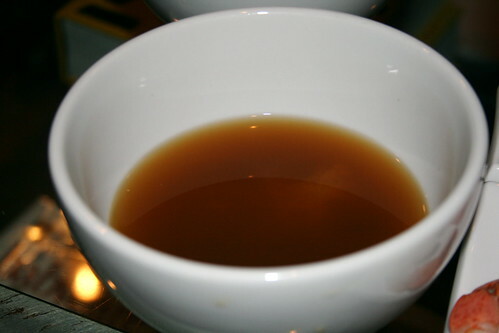 Are you eating lots of bone broth? Are you taking cod liver oil? How about coconut oil? As for the thyroid function, are you taking Iodoral or Lugol’s? My corn allergy is very severe, so maltodextrin is out. I tried Lugol’s many years ago, but had trouble breathing adn broke out all over (I developed life-threatening multiple chemical sensitivities after pesticide and solvent exposure in the 90s; it made all my allergies and sensitivities much worse than they used to be). I did use kefir for a while 3 years ago (raw milk), but after a couple months my dairy allergy flared up badly and now I wheeze from even a spoonful of dairy. Yes, lots of bone broth (some is actually simmering as we speak. Er. Type.) and I take cod liver oil, deep sea salmon oil, and raw coconut oil daily. What I’m doing so far is helping, and I’m at least 300% better than I was, but it’s slow going with all the allergies and sensitivities. I think I might get some raw saurkraut and try a little juice each day as a probiotic…. You poor thing! It must be hard being allergic to so many things. I’m glad you are 300% better though — that is fantastic! The raw sauerkraut juice is a great idea. Dr. CMcB recommends that too. you could start very slowly and work your way up. Do you do daily juicing? I bet that would help you tolerate the probiotics better. The itching and skin issues are signs that the body is trying to clean house through the pores. Juicing really helps the body detoxify. It’s certainly not easy at times, but I do feel much better when I stay away from the foods (and other things) I react to. I did try juicing for a while, but it led to blood sugar spikes so I had to stop. My body seems to need the fiber even in lower carb veg like celery to prevent the spike. I do have lots of leafy green veg, though, about half raw and half cooked. When you were juicing, were you using fruits? I was thinking you could just juice green vegetables and stuff like that. Would that spike your blood sugar? Nope, just green vegetables like celery, cilantro, etc. I did try beets and carrots once, but one sip proved it was way too sweet just on taste, so I added it (and the pulp) to a soup instead. I’ve had to stay away from most fruit for years now. When I eat leafy green veg it’s always with oil to slow down absorbtion of any sugars. So long as I have plenty of coconut or olive oil or ghee and make sure to have protein at the same time, I’m fine. If I skip the oil or the protein, it’s not pretty. So interesting! Sorry to keep asking you so many questions. I’m just fascinated by your story. What do you think did so much damage to your health (other than the pesticide exposure you mentioned)? I’m not really sure, but I suspect a big issue was having undiagnosed gluten issues for 45 years. I’m probably extremely fortunate that at least half of those years I ate little wheat/gluten because I preferred eating low-carb — I felt so much better on it! Another issue may be CFIDS/CFS. I got ill in 1980 with mono and afterwards felt like I had a bad flu for many years. I was diagnosed with probably long-standing CFS in 1998; my dr then thought it might have been triggered by the mono. I also have some funky sort of endocrine issues. I’ve been chronically dehydrated for many years because my body doesn’t hold on to either sodium or water. I did a trial of desmopressin this year that made a huge difference, but then developed an allergy to the medication. It did help reset my body, though. I don’t have nearly the loss of sodium and water I used to have. I suspect a brain injury in 1997 might have contributed to the pituitary issues, since the losing water adn salt started about then, I think (it’s a little fuzzy around that time; it took a while for my memory to come back). I suspect adrenal and/or thyroid issues as well (or it might all be pituitary); my tests come out low-normal, but I don’t tolerate any of the medications. Wow, she looks so much like you!!! !